The Masters. Even when I say it, I can still hardly believe I was there for a week. 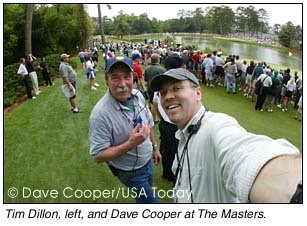 As a newbie on the USA Today photo desk, I was already a bit overwhelmed when the bosses popped out a couple of weeks into my new job and announced they were sending me and staff photographer Tim Dillon to Augusta National. Yikes! Of course, I've never been to the hallowed grounds and Tim had only been there as an editor a couple of years ago. I began getting the scoop from Masters veterans Eileen Blass, Julia Schmalz and Paul Whyte. Can't do this, can't do that, they said. Gotta have stickers, armbands, earphones on the radios, can't go inside the ropes and most of all, "NO RUNNING." Yep. Whether you're at the pool or the Masters, you can't exceed a fast walk and they ARE serious. Since it was just Tim shooting and me editing, we were charged to go for images and ideas that would be a bit more unique than guys swinging a club. How is that possible with what people are saying about all the restrictions, I wondered? I arrived a day early and found that the "cone of silence" had somehow lowered itself over the city because my cell phone was DOA. Plenty of battery and signal, but no call out and no call in. This is not a good sign, I thought. I barely slept, got up at the crack of 0 dark thirty on Monday and headed out to Gate 4 to see if they'd let me in. Wow. They said it was beautiful and they were right. And green. Very green. Everything from the grass and tree leaves to cups, chairs, trash bags, jackets, umbrellas. Green as far as the eye can see. A bit too traditional for green ketchup, though. I found my spot in our little corner of the AP's concrete bunker and tried to map out a strategy for telling some different stories. I was hoping my love for southern-style sweet tea and my modified Kentucky accent could help gain us a little access. My contact there, Martha Wallace, had been incredibly helpful and I was sure we'd be able to work out deal for us to shoot a story a little off the beaten path. Maybe we could see what life is like in the day of a caddie or maybe an interesting groundskeeper - anything that doesn't look like guys swinging a club. Not so fast. All my ideas had to go through higher powers and were met with always polite, but always firm, "No, we really don't do that here." Rats. Indeed, there are plenty of things they don't do there. The biggest challenge for Tim was not being able to be inside the ropes. He was a lone ranger amongst the masses. No easy task, but one that he took on with enthusiasm and ended up getting some great pictures. Other hazardous duty included coping with the heaviest rain the course had seen in quite a few years. The extra precipitation had Augusta National smelling like the barns back in Kentucky, but it didn't dampen our spirits. Easy for me to say since I was in the concrete bunker. I'll have to say the highlight of the week for me was Arnold Palmer's last hurrah on Saturday. Rain postponed the end of Friday's second round so Palmer finished on Saturday and it was quite a site. A living legend walks up 18 for possibly his last round of competitive golf. Amazing. I would've killed to be able to make a frame or two, but the risk of getting our credential pulled didn't make it worth it so I just tried to soak up the moment. After Arnie's piece of golf history, it was time to concentrate on the final round. The biggest strategy of which is where you get your chair down on the 18th. Lady luck smiled on us as Tiger finished in front of Tim and all was right with the world. We owe a huge debt of thanks to Gene Blythe and the entire AP crew as well as the folks from the Chronicle and the AJC. Thanks to Fred Sisson and the folks at Nikon for a fun Masters photog gathering, too. Also thanks to Brandon Layton, our runner, who did a great job the last four days. And of course, Martha Wallace and the entire Masters crew. Of course, my hat's off to Tim Dillon for amazing work under incredibly tough conditions. But I think he'd agree that it's not easy being green, but well worth it for a week at the Masters.